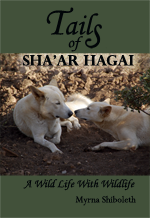 In Tails of Sha’ar Hagai Myrna Shiboleth takes us with her on an extraordinary journey; as she emigrates from the United States, pioneers in Israel, lives and travels in Africa and Europe, and establishes the breed known as Israel Canaan Dogs. In episodes that are alternately hilarious and poignant, we join her as she struggles to set up home in a bullet-ridden, abandoned concrete bunker, and build a life shared with family, friends, and a variety of furred and feathered companions. From desert-living wild dogs, to Baba the hand-raised hyena; Ricky the overly curious raccoon, Shusha the fox and Um Fathi, the local village witch, she shares her stories, and gives insight into both struggle and strength. Every one of these amazing characters teaches us something about what it means to be human.